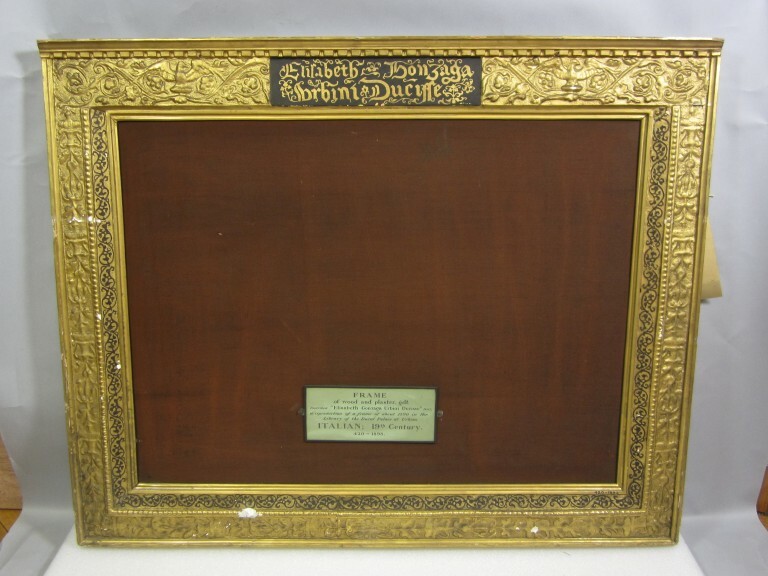 Frame of wood and plaster, gilded. The upper border has a black panel in the centre, bearing in gothic gold letters the name 'Elizabeth Gonzaga Urbini Ducisse'; on either side are eagles with wings displayed amid interlacing floral scrolls. The other three sides are decorated with a repeating but reversed design of a symmetrical plant issuing from a vase. A narrow border painted in black with floral scrolls runs round three sides of the frame. A reproduction by Signor Giosué Lumaconi of an Italian frame of about 1500 in the library of the Ducal Palace at Urbino. In design this is a cassetta frame, but the top horizontal is a superimposed entablature with dentilled moulding that is at odds with the other three sides. The sight edge and back edge mouldings have very flat and straight surfaces (though warped) quite unlike what one would expect to find on a gilded 16th century frame. A heavy, granular, white gesso has been used. There is no hanging fitting on the back, only mirror plate holes. 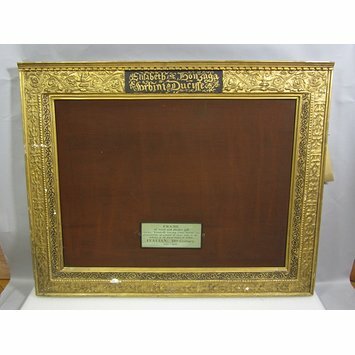 Letter from Lumacomi to Armstrong 21/1/1893, explaining how Lumaconi went to Urbino, and got Signor Gualdesi, professor in the Accademia delle belle arti to copy the two frames (ie construct them). It seems clear that Lumaconi then gessoed, gilded, burnished and painted them in his Perugia workshop. They were seen and admired by Lemo, Rossi, Scotti and Signor Prof Costa. Lumaconi claims that his price quoted (1200 lire) allows him, after the costs of bringing the frames to Perugia, only 1.5 or 2 lire per day for his work of gessoing, 'beating the gold especially to imitate the antique finish', gilding and burnishing, and requests additional payment.